Live the Life you Want <3: Acceptance. My mom told me that I need to get on more and update. So here I am. My birthday was in February. I'm 18 now! Nothing changes much other than the fact that I can AMA which is beastly. My day was good. 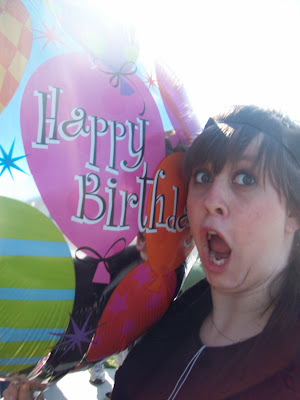 Nathan Got me a HUGH balloon, made me cupcakes and a scarf. It was great. After school, since I didn't have dance rehearsals, one of my best friends William and I went to Wendy's. He wasn't feeling well so he took me home. We decided we are going to go to Monterey for our birthday's. Simba is working hard on his training. The Speechies and Drama geeks love him! Unfortunately during on of rehearsals, he hit his head somehow and now he has a huge gash on it. No fun at all, but he's one tough cookie. My seizures have decrease tremendously! I'm so excited about that. Now when I have one, I'm much more sore than I used to. Heather is doing so well with fulfilling her dreams as a hockey announcer. Mom needs to go out on a week long vacation. She needs it! Any takers? Well times are changing as well as the season. Graduation is coming up and nervous/exciting about it. I know I'm heading to Delta and catching a ride with Caleb. He disagrees "I'm going to get a bug for he can't fit in it." I laugh and say "Then he is sitting on your lap." He chuckles "Then we crash and die because of your dog." She comments "No, because of your lack of acceptance."